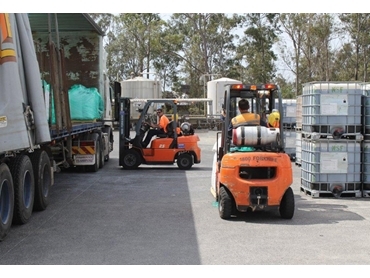 Albright & Wilson, a leading supplier of phosphates and surfactants for the household and personal care market has signed on for another term with Lencrow Group for the supply of forklifts. Lencrow Materials Handling has been the forklift supplier for Albright & Wilson for the past five years. This time Lencrow supplied the EP brand of forklift equipment from China. Ross Smith, Hire Manager for Lencrow Materials Handling explains that Lencrow has been importing the EP brand of equipment since 2003 and is impressed by its quality. EP forklifts have been supplied to Albright & Wilson as they not only meet the performance requirements of the client but also their budget. The units have been operating on Albright’s Sydney site for over six months now and are costing less to run than the last brand supplied by Lencrow. Joanne Smith, Purchasing Officer for Albright & Wilson says they have been using Lencrow for many years and have been impressed with their recommendations and service. The new EP units have been supplied at a considerable saving over other brands. Lencrow supplied seven EP 2500kg forklifts with container mast and side shifting fork positioners fitted. Albright also required one flameproof unit and the flame-proofing was done locally in Australia to ensure compliance with local requirements. Merv Staines, Maintenance Manager at Albrights says the new units have been well accepted by the staff and tick all the safety requirements on the site. All units supplied by EP are built to Lencrow’s strict requirements, comply with Australian standards and are supported Australia wide by the Lencrow aftersales support team.